Call me naive, but I was genuinely looking forward to an official definition of "sustainable" winery. We've screwed up "organic" already, "biodynamic" is weird religion, and "natural" is vague. So I had hopes that the California Sustainable Winegrowing Alliance could learn from previous mistakes and give us a useful term that would, in a nutshell, help consumers identify the good guys. I am naive. The definition came out yesterday, and it's nearly worthless. Moreover, almost all of the 17 companies that already qualify are big corporations, including E. & J. Gallo Winery and Constellation Brands, the nation's two largest wine companies. That means both Arbor Mist Strawberry White Zinfandel and Wild Vines Strawberry White Zinfandel are sustainable, but Adam Lee's single-vineyard Pinot Noirs at Siduri are not. Sean Thackrey's outdoor-fermented wines are not. Basically, almost all small-production wines made by people who care about the vines are now officially "not sustainable." It's green-washing, plain and simple. The Wine Institute, which gets its funding from members based on their size, has chosen to allow 3 Blind Moose wines to wear a "sustainable" label so they can sell better to young shoppers with a twinge of social consciousness. This is disappointing because in theory, "sustainable" is the most logical term for Earth-conscious wine production in the US. "Organic" has two big flaws: you can't call a wine "organic" if it includes added sulfites, which are necessary to preserve its fresh fruit. And, unique to wine, if it's really rainy one year, a farmer might have to choose between spraying a little anti-mildew chemical and losing his organic certification for years, or losing his crop. I actually prefer "biodynamic" to "organic" for US wines because it allows farmers a few mildew-control options, but at the same time, it is essentially a religious belief that demands farmers follow the cycles of the moon, bury cow horns full of dung, and that sort of thing. "Sustainable" is perfect in theory for wine, in that it allows farmers to use minimal intervention in good years and take necessary steps in tougher ones. But with 3 Blind Moose wines already "sustainable," the term is compromised before it ever becomes a label sticker. What does "sustainable" officially mean now, exactly? That's a good question, and not one to which the Wine Institute can provide a good answer (and I have asked, repeatedly). There are 227 "best management practices" on which wineries are supposed to grade themselves, as well as 58 "prerequisites." I've plowed through some of these areas in what's available online and there are definite good points about the program. Wineries are required to examine their performance in areas they might not have considered before, like energy efficiency and ecosystem management. The basics, like soil management and pest management, are in there as well. I'm probably the only person who's going to write negatively about this program, because improving performance in all these areas -- from air quality to human resources -- is a good thing. But the big problems just won't go away. 1) It's based on self-reporting. 2) You can keep a good rating by "improving" weak areas, rather than achieving definite targets. 3) It's easier for a big company to find the time to do the paperwork, and that's obvious by the list of giant companies that were in the pilot project. There are a few exceptions (good job, Honig Vineyard & Winery, Kunde Family Estate and Cooper-Garrod Estate Winery). But most of the list is behemoths*, including Diageo Chateau & Estate Wines, Meridian Vineyards and Concannon Vineyard (owned by The Wine Group, the 3rd largest US wine company). * Conspicuous by its absence is Bronco Wine Company, makers of Two Buck Chuck, and easily the largest company not to participate. Owner Fred Franzia doesn't get along with the mainstream of the U.S. wine industry, having lost some nasty lawsuits, and that may be why. But a test of the usefulness of this initiative is whether there will be any pressure on Bronco to join the party. "Sustainable" means a wine company must document its attempts to continuously improve its performance in 227 areas, including some related to farming, the environment and community relations. In other words, "sustainable" is well-meaning corporate-speak. That's not what I'm looking for when selecting a wine, and I suspect that most of America is with me on this. If you want a wine made by a winery that cares about the Earth, you'll have to stick with "biodynamic" or "organically grown grapes" (sigh) for now. Yep! If we start seeing "Sustainable" on most of the mass-produced bottles in Safeway, it's going to become just more meaningless noise on the label. It's really too bad, because growers in our area (Lodi) that are participants in Lodi Rules have remarked that while the record-keeping is a pain, they feel they are managing the vineyards and their workers just a bit better. If actions of the big players water down the meaning, we'll either see growers drop out of the program or seek more distinctive branding. "The Lodi Rules are based on the Lodi Winegrower's Workbook and are designed to lead to measurable improvements in environmental health of the surrounding ecosystem, society-at-large, and wine quality." Also, when the program was established, it was quickly recognized that it would have no merit without third party certification. So I'm thinking we might see a number of smaller groups distance themselves from whatever the seal looks like on the labels of the big players and come up with their own branding with "sustainable" in the secondary position. It seems that politicians, business people, and even some in the media can just say what they want nowadays. Whether it is true or not no longer matters, just as long as it describes what they should be doing or what their followers want to hear. Apparently it's not necessary to be honest anymore. Blake, I’m sorry you were unable to join us at the press event and speak to the vintners, growers and experts who have worked for years on developing our new Certified California Sustainable Winegrowing (CCSW). I think you might have had a different take on the program. - CCSW was created by and for small, medium and large CA wineries and vineyards by the CA Sustainable Winegrowing Alliance, an NGO created by Wine Institute and CAWG, and a group of 50 vintners and growers of all sizes over the past 3 years. The goals were to enhance transparency, encourage participation and advance the entire CA wine industry in environmental stewardship, natural resource conservation and socially equitable business practices. - The 17 companies that received certification for some or all of their operations were part of the pilot to test requirements and offer feedback to fine tune certification which is now available to all CA wineries and vineyards. They represented all sizes and regions, as it was important to see how the program would work given CA wine’s diverse regions, companies and wines. Importantly, CCSW is certifying winery and vineyard operations, not brands. This list and other materials are available online; there’s plenty of detail for those who care to dig deeper. - This program is NOT green washing. It is not an effort to define “sustainable wine,” and we are not allowing the use of a logo or claim on the bottle. Anyone who is certified must adhere to the certification requirements, which include, among many others, meeting 58 prerequisites, which are verified by an independent auditor. They must demonstrate continuous improvement annually to maintain certification. I'd also like to address your 4 points. 1. Certification requires third party verification. 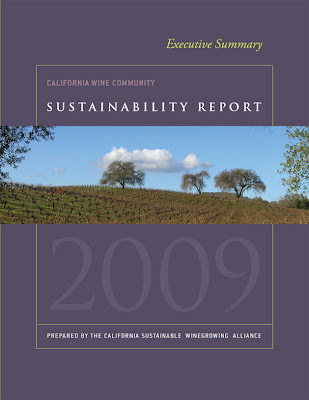 I want to emphasize that the Sustainable Winegrowing Program (SWP) should not be confused with CCSW. SWP is an educational program designed to help promote the widespread adoption of sustainable practices and is based on self-assessment and reporting. CCSW adds third party verification of the accuracy of self-assessment data in addition to adherence to a process of continuous improvement and other requirements. 2. You can’t achieve or maintain certification by just improving weak areas. CCSW is “process-based” because it meets the most important SWP principle –the concept of continuous improvement tailored to the most critical regional and organizational issues – and is applicable across diverse regions for both wineries and vineyards. After meeting 58 prerequisites, companies use their own baselines to determine what areas need to be improved, focus their limited resources on practices that will make the most difference and continually improve. That is a big commitment that was summarily dismissed. We are also now developing metrics to measure and track sustainability performance in areas such as water and energy use, GHG intensity and others. Once the metrics are in place, they will tie into CCSW. 3. This is not a “big company”-only program. The certification program was specifically designed for use by wineries and vineyards of all sizes, especially important given that the vast majority of the industry is small, family-owned wineries and vineyards. It’s nice that you commend the smaller pilot wineries, but larger wineries should not be degraded when all undertook the same certification process. 4. You are correct that the concept of sustainability is inherently complex. It’s about how decisions get made on a daily basis while balancing environmental soundness, social responsibility and economic feasibility. Our goal is to affect change. CCSW is an honest attempt to speed adoption of sustainable practices, which we believe lead to higher quality wine and the long-term viability of our industry. I would be happy to meet with you over a glass of CA wine to provide more details. Also, you’ll soon be able to view the press event in its entirety at www.sustainablewinegrowing.org. Participating in the Central Coast Vineyard Team's Sustainability In Practice (SIP) or Lodi Rules or this new program doesn't mean you are sustainable and another organization is not. It means you are taking advantage of the collective knowledge of the groups doing their very best to develop best practices and advance the cause of sustainability. Sometimes a cigar is just a cigar. Large companies have resources that allow them to pursue and develop programs and have both the most to gain and most to lose from the development or lack of development of such efforts. The sea change in the industry in farming practices and ethical treatment of workers and communities cannot be denied over the past couple of decades. Greenwashing will always be outed and failed. This effort, and the related SIP, Lodi Rules, Napa Green efforts all should be applauded and encouraged to do even more. Allison: Email me, let's talk. Jon: I haven't looked deeply into Lodi Rules but it does seem like a good program; I'll have to pay closer attention to it. Jim: What you haven't written here is that you previously worked at a big wine corporation that had as good a commitment to the environment as any large company in the wine industry; I respect your experience. That said, I think your experience was unusual and I think I'm just more cynical than you are. Smitix: I wish you weren't right, but too often what you say is true. Wine enthusiast and wine geeks will ignore this corporate generated white noise "sustainable" and continue to buy their wine from producers that adhere to the quality and ethical standards they wish to support. The other 95% of us will continue to purchase wines with pretty labels, critters and catchy names. " Same as it ever was ".